Seemingly striking a blow for ecological balance, a Caribbean reef shark chomps on an invasive lionfish in the clear waters of Roatan Marine Park off the coast of Honduras. Working with park officials, local divers are attempting to give sharks a taste for the alien reef species, which are native to the Pacific and Indian Oceans. With no natural predators, lionfish populations have exploded throughout the waters of the Caribbean and U.S. Southeast since their accidental introduction by aquarium hobbyists a decade ago. 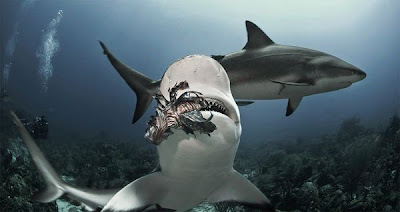 In Honduras "local dive masters familiar with the sharks decided to try to turn them on to eating invasive lionfish," said photographer Antonio Busiello, who recently snapped images of the efforts during three months of diving on the site. "If these predators start to see lionfish as prey, eventually, in time the lionfish may be kept under control as a part of the ecosystem. That was the idea."